(Bloomberg) -- Asian stocks looked set for a mixed day after a muted U.S. session as markets remain hostage to a crucial round of trade talks. The dollar strengthened for an eighth day, and 10-year Treasuries fell. Futures were higher in Japan and Australia, while contracts in China and Hong Kong pointed lower. The S&P 500 Index finished little changed after drifting most of the session. 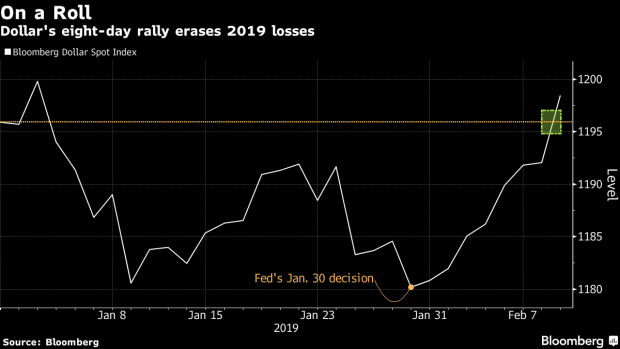 The dollar entered its longest rally since January 2016, recouping its year-to-date losses, as central banks around the world tilt more to the dovish side, boosting the relative appeal of the greenback. Investors are weighing the prospects for success of this week’s high-level U.S.-China trade talks ahead of a March 1 deadline for higher tariffs, while mulling the likelihood of a U.S. recession and its impact on earnings as reporting season rolls on. The threat of a shutdown in Washington also looms, with political tensions flaring again between Congress and the president. Elsewhere, West Texas Intermediate crude slipped to its lowest close in two weeks, while gold headed for its first drop in three sessions. The pound stayed lower after the U.K. economy unexpectedly shrank in December. Futures on the Nikkei 225 rose 0.5 percent in Singapore. Australia’s S&P/ASX 200 Index contracts were up 0.4 percent. Hong Kong’s Hang Seng Index futures fell 0.1 percent. The S&P 500 Index fell less than 0.1 percent. The offshore yuan lost 0.2 percent to 6.8008 per dollar. The euro fell 0.4 percent to $1.1276. The British pound dropped 0.7 percent to $1.2861, the weakest in almost a month. The yield on 10-year Treasuries rose two basis points to 2.65 percent, the first advance in a week. West Texas Intermediate crude decreased 0.6 percent to $52.40 a barrel, the lowest in two weeks. Gold sank 0.5 percent to $1,308.23 an ounce.